Yesterday was the Houston Tour de Cure. As you might know, I have been training for several months for this event. And unfortunately the rides were canceled due to weather. Bummer! Though disappointed, I understand the cancellation because it has been very rainy the passed few days and the routes were very flooded and covered with debris. Despite the rain out, they still had the after race activities. There was a lunch, live music, and various diabetes awareness booths. They served brisket, potato salad, green beans, and rolls. And the band played various tunes; from country music to Pink Floyd and Foo Fighters covers. So all in all it was a good day even though I did not get to ride. There is talk of rescheduling the ride for a later date but we’ll see what pans out. On the bright side there were over 2,000 riders registered and were able to raise over $600,000. And team red (the team for people with diabetes) had over 300 riders and we were able to raise over $100,000. Which is awesome! It is great that we were able to raise so much money towards such a just cause. I am definitely planning on riding next year and hopefully we can raise even more money next year. For those of you who follow me on twitter you know that I recently went to the doctors to get my first a1c since my diagnosis. For those of you who don’t follow me on twitter, you should @typeonefun. When I was diagnosed with diabetes my a1c was 9.8. So you can imagine I was quite nervous/anxious leading up to this test and waiting for my results. However the results are in and my new a1c is a 5.2! I am very happy with this number but I was nervous about some of the blood cells still left over from my diagnosis affecting the outcome of this a1c. That apparently was not the case. My doctor said that the 5.2 is too low and that I have been too aggressive with managing my diabetes. I however to do not agree with him. While I might be aggressive with management, I am happy with the results and am happy with the management routine I am doing. If I were constantly having low blood sugars or if my management was interfering with my life I would agree with the doctor. But that is not the case at all. I quite satisfied with my diet and the foods I eat. And I am happy with my exercise routine. The exercise I do has been very helpful with managing my diabetes. Before I started working out and bike riding regularly I was using around 25 units of insulin a day including my basal rate. Now, due to the exercise, I take around 14 units of insulin daily. And some of this is due to my pump because I can now take fractions of a unit unlike using the pens where I can only take whole units. I also believe that my low carb diet is helpful in managing my diabetes. I try to eat less then 80 grams of carb per day and usually average less than 50. Going out to eat throws this off sometimes but oh well you have to splurge once in a while. My theory is that the less carbs I intake the less chance there is for my blood sugar to get high. Now one could argue that is easier for me to manage my diabetes because I am still in the “honeymoon” period. Which is definitely true. I am for sure still honeymooning and therefore my blood sugars are easier to manage. However another theory of mine is that if I keep tight control over my blood sugar and keep the load off my pancreas, I can prolong my honeymoon phase and preserve my remaining beta cells for a while. But all in all I am very please with the outcome of my first a1c. I hope I can keep a good grip on my diabetes and can continue to have low a1c’s. As you may or may not know, I bought an insulin pump and have been using it for less than a week now but I can already say that I love it. It has made my life so much easier. I no longer have to carry a separate case for my insulin pens and needles. The less I have to carry around the better. In fact, the only part of pumping that really worried me was being able to sleep with the pump clipped onto the waistband of my boxers and the hose getting tangled or pinned underneath me. But I have been sleeping fine with it and the hose/pump has not been bothersome at all. Which is good because lord knows I value my sleep. The Tandem representative that came to my house was very helpful but ended up not wanting me to get hooked up to the pump. She requested some orders from my doctor for my basal rates, carb ratios and correction factors but the doc has yet to come through. So she did not want me to do anything with out the doctors consent. But me being an eager beaver decided to just hook myself up any way and use the numbers which I know to be accurate from my experiences. So I made the decision to bypass the doctor for now until I hear word and can cross reference our numbers. But all that said, let me reiterate how much I am enjoying the pump and I definitely recommend the t:slim to people new to pumping or people who just want a new pump. Keep and eye out for a full review of the features of the T:slim in the coming days. 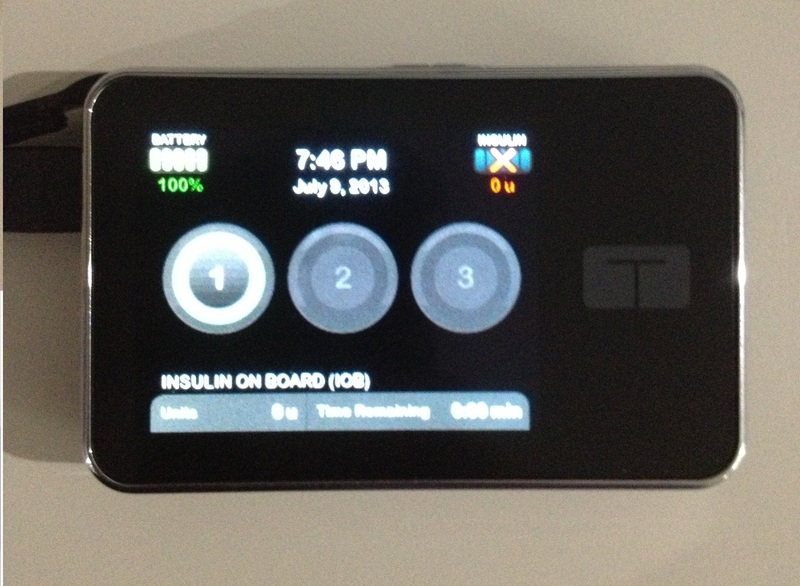 After a few months of waiting it is finally here, my new Tandem t:slim insulin pump! I am pumped (nice pun eh?). Unfortunately it took several months for me to actually get the pump but the wait is finally over. Last week I received confirmation that my health insurance provider deemed the pump to be “medically necessary” and have decided to cover some of the expenses. So here I am a week later with my brand new insulin pump and just in time for my birthday too! The only down side is I have to wait until Friday before I can hook my self up. Well I guess I don’t have to wait but it is advised that I do. On Friday, the Tandem rep in my area is coming over to my house again to help me get setup with my basal rates and to train me on the pump. Talk about good customer service, eh? It’s not every day a company sends some one to your house to help you out. She has been nice enough to contact my doctor and endo to get my basal rate information so she can fully help get me started pumping. I am really looking forward to start pumping as well as beginning my life as a complete diabetic cyborg! I have a feeling this pump will be a game changer! Today I have officially signed up to participate in the Tour de Cure in Houston on September 21! For those who do not know what it is (or do not want to click the link to find out) it is bike race put on by the American Diabetes Association to raise funds for Diabetes research. There are several different lengths of track: 10 miles, 27 miles, 47 miles, 63 miles, and a little over 100 miles. So there is a track for just about any cyclists desire or skill level. Whether you are a casual rider or a die hard cyclist or somewhere in between, there is a place for you. I have signed up for the 27 mile track, and I feel that will be a good starting point for my cycling career. As of right now can do about 10 miles around my town so we will see how challenging the 27 miles will be. The race isn’t until September so I will have a lot of time to train as well. This will not only be my first diabetes fundraiser as an adult/diabetic but this will also be my first cycling event in general. My parents got me a fairly nice new bike as an early birthday present which is very generous of them to do, and I have been riding a couple miles everyday since I got it. My thighs hurt! But I love it; it is so fun to ride! I have signed up for Team Red which is a national team open for all people with Diabetes or people whose lives have been affected by diabetes. We get a nice red jersey so spectators can spot us easily and direct their words of encouragement our way. I am very excited to participate to help raise money for such a worthy cause and have fun doing it. I also hope very much to meet people and hear their stories and hopefully be able to tell my story. If you would like to help sponsor me just follow this link or if you would like to donate towards Team Red as a whole please follow this link. What if diabetes type I is spread like flu? What if diabetes type I is spread like flu?.